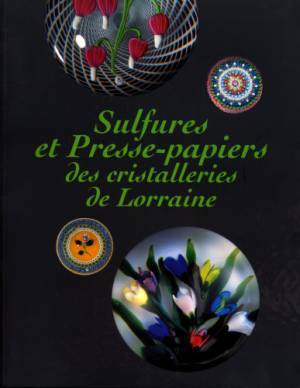 This exhibition catalog documents the exhibition in Lorraine to celebrate the 50th anniversary of the rebirth of glass paperweight making at the Baccarat and St. Louis factories in Lorraine. The exhibition shows the best of 20th century paperweights from these factories. Over 500 paperweights and paperweight-related objects are in the exhbibition, not all of which are shown in the catalog. In a sense, the Exhibition and Catalog honor the work of the late Paul Jokelson, who convinced Baccarat and St. Louis to resume the manufacture of paperweights in 1953. 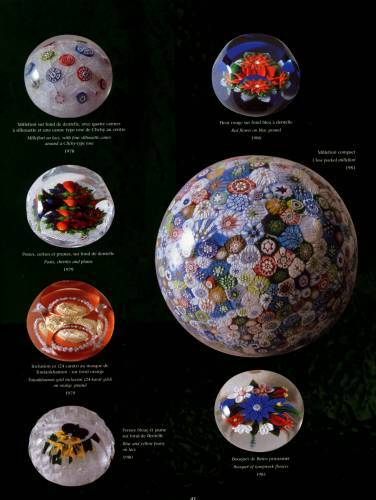 The catalog includes wonderful examples of modern paperweights from Baccarat and St. Louis. In contrast it also includes the famous 1853 Baccarat Church weight from Baccarat and the Bird in the Nest paperweight that started Paul Jokelson's first collection. 64 pages with over 200 paperweights shown in color including 10 full page pictures. 7 3/4" by 10". 2003. Limited printing of 1000 copies. In French.